Wooden dog crates are preferred by dog owners who like to give their pets a quality enclosure that is comfortable, roomy and looks good. In most cases, it is a onetime investment that lasts for years. Wooden pet crates come in a variety of shapes, sizes and material options for indoor and outdoor uses. Indoor wood dog crates fit easily into any décor theme especially dog crates that look like furniture. To help you better to make the selection – we’ve prepared this small guide and a list of the quality dog crate furniture available on the market. Why Should You Buy a Crate For Your Dog? Below you’ll find in-depth reviews of wooden dog cages seen above. Increased awareness and a wider exposure to the internet has helped new dog owners realize the importance of crate training. It is a very effective and stress-free way to introduce your dog to their own sanctuary. There are more reasons for you to get your dogs trained than not. For starters, a crate trained dog is less likely to get injured during travel because they are less likely to distract you while driving on the highway. It also helps prevent separation anxiety, aggression, destructive and dominant behavior. The challenge though, is to find the perfect crate. Dog crates come in many sizes, materials, shapes, and styles. Although the most commonly seen ones are plastic crates or wire crates that have become synonymous with dog crates, no other material offers the durability and the stability that wood does. In most cases, people suggest that getting a crate so a dog can easily stand and turn in, is the pre-requisite and everything else is secondary. However, there is more to it than just getting the sizing right. Undoubtedly, the first and the most important factor is the type of wood used to make the crate. The most commonly used ones are maple wood, mahogany, cherry wood, and walnut. All of these are extremely durable and can sustain the wear and tear of everyday use. They are also lightweight, making them perfect for wooden crates. Some newer crates are also made of engineered wood that can replicate the look of almost any type of wood and they are very durable. Nothing can match the aesthetics that a wooden cage gives – you won’t need a dog crate cover for this!. Almost every wooden crate in the market is multifunctional. While some can be folded and dismantled completely when not in use, to save space, others can double up as a folding gate for a specific area of your home or lawn. The most popular variety is the indoor wooden crate that doubles as a coffee table for your living room. A sliding, removable bottom panel is ideal to allow you to clean the crate easily. Easy access to the interior of the crate allows easy cleaning and a waterproof surface prevents the wood from warping, a must-have. If you intend to keep the crate inside your house, you’d want to ensure that you buy one that fits nicely in a room without looking oversized. A coffee table crate serves as a multipurpose option for any house or office setting. Folding cages are definitely a better choice for compact sized rooms and RVs. Keep in mind, the dimensions of the crate need to allow your dog to comfortably stand, sit and lie down with some extra headroom. However, do not select a crate that is too big or your dog may start to soil in one part of the crate and sleep in the other. While that covers the essentials, there can be a lot more to consider when it comes to buying a wooden crate for your dog. The finish, portability (casters and rollers), the load capacity (for larger dogs) and chew-proof cages for escape artists are some of the additional features that pet owners desire. Below is our list of the top 5 wooden crates for dogs in the market. Constructed from durable hardwood and available in three different finishes, the Crown Pet Crate is one of the most popular wooden crates for dogs. As the name suggests, it doubles up as a coffee table and the premium finish fits most home décors. Most people wouldn’t even notice that it’s a dog crate unless they look closely. This wooden dog cage has a very small footprint. The medium crate is 21 x 29.7 x 24 inches. It will not look oversized even in a small apartment. At the same time, it offers enough room for the pet to stand, lie and turn around. Dog crate furniture featuring durable hardwood construction available in two finishes. The multiple vents allow for a well ventilated resting den for your dog and gives your pet a 360-degree view of the surroundings. Access to the crate through a swing door that rotates to the inside does not eat up valuable space in your home. A removable MDF floor with a melamine coating allows easy cleaning and maintenance. This wooden crate has a stylish appearance, solid construction (Mortise and Tenon), waterproof flooring, multiple finishes for décor compatibility and a plastic clear-floor for dogs that like to chew. There’s not much more than you can ask for from a wooden crate. It has it all. This is hands down, the best dog crate end table that you can buy. Do you plan on adding an end table to your living room? How about one that also functions as a dog crate? This amazing little dog crate from Richell is a versatile furniture piece that is flawlessly designed. This dog crate from Richell is just the right size for large as well as medium-sized dogs. Its appeal stems from the stunning finish and the incredibly useful top surface that can easily hold up to 50 lbs. of weight without adversely affecting the crate or your dog inside. Vase, lamp or other sundry details, this wooden dog crate will hold it perfectly. It is available in two sizes by the way and you can pick the one that best suits you. The construction is really solid, not a flimsy, cheap replica. Access to the cage is made easier by a door that swings all the way to the side and latches on to the vents with a side stopper attachment. Also, the bottom of the crate is a sliding tray that can easily be removed and cleaned. All wood construction and superb design make this a great choice for an indoor dog crate. 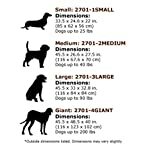 It can easily accommodate dogs of many sizes since it comes in two dimensions. The Precision Pet Extreme Log Cabin dog kennel will make a great addition to your lawn. Solid wood construction is sealed with a weather-resistant coating. At 45 x 33x 32.8 inches it is an ideal dog house for extra large sized dogs or 90 pounds. If you have a Labrador, a Golden retriever or a German shepherd, then you’ve just found the best large wooden crate for your buddy. Precision Pets wooden dog kennels are very popular because of their superior quality that does not compromise on aesthetics. The quality of construction and design will give you a maintenance free dog house that will last for years. It is very difficult to find a wooden crate for the outdoors that’s weather resistant and looks natural. Precision Pets Wooden Kennel is a great choice for pet owners with large sized dogs. It is durable, looks amazing and comes at a very attractive price point. The 2-in-1 configurable pet crate and gate from Merry products is a favorite with homeowners due to the versatile multipurpose design. As the name suggests, it can be configured into a compact wooden crate and unfolds into a sturdy gate when not in use as a crate. Featuring a hardwood construction with a walnut finish, this is a perfect addition to any home or décor theme. This 2-in-1 pet crate is shipped in a large sized box and is protected by Styrofoam to prevent the finish from getting scratched. Assembly is extremely easy. Line up the hinges which are preassembled and drop the hinge pin in it. The crate features metal bars that are strong and welded to prevent your dog from chewing through it or escaping by bending it. When used as a gate, it suffices to keep smaller and medium-sized dogs confined to a specific part of the room or the house. Specific areas in your home can be blocked by easily removing each of the panels. The fact that it can be dismantled, also makes it a low maintenance option that is easy to clean. A removable plastic tray that slides out can be washed to clean it easily. This is a very versatile wooden crate that has one of the best designs. The cover is solid wood veneer and the dark finish blends in with many décors. Priced at under $150, this is a great buy. Last but not the least, we have this tastefully designed Pet crate that doubles up as an end table. Crafted from rubberwood or hevea wood, which is environment-friendly, this compact sized crate has a beautiful mahogany finish that is much sought after in furniture pieces. 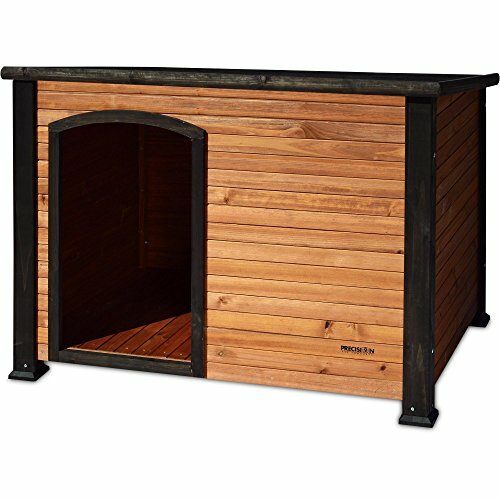 Features a hard-sided wooden frame structure with slats that allow excellent ventilation and sunlight for the pet. If your pet has a habit of breaking out of the crate, then you can use the latch on the front door to secure it. Leak-proof keeping the surroundings clean and hygienic. This is a cozy resting place for your pet that also doubles up as a very useful and practical furniture piece. The construction is top notch and it also has a great finish that is perfect for use in the living room or the bedroom. With minimal assembly and a great price point, this wooden crate from casual home is a perfect choice for pets of all sizes.